Artist Christo will finally realise plans to envelop Paris' Arc de Triomphe in 25,000 square metres of silvery recyclable fabric and 7,000 metres of red rope. L'Arc de Triomphe, Wrapped was first conceived by Christo and Jeanne Claude, his late art partner and wife, in 1962. Now, after nearly 60 years, the architectural artwork will be realised in collaboration with the Centre Pompidou. It will be on view to the public for two weeks from 6 to 19 April 2020. The project will see the iconic 49.5 metre-tall monument on the Champs-Élysées sheathed in a silvery blue fabric made from recyclable polypropylene, secured with 7,000 metres of red rope. It will be run in collaboration with the Centre des Monuments Nationaux and the Centre Pompidou – the latter of which will also be dedicating an exhibition to Christo and Jeanne-Claude from 18 March 2020. Christo has illustrated the anticipated result in a series of drawings and photographs overlaid with pencil, wax crayon and enamel paint. The spaces beneath the famous arch, including the Tomb of the Unknown Soldier, will be maintained and accessible throughout the period when the artwork is in situ. 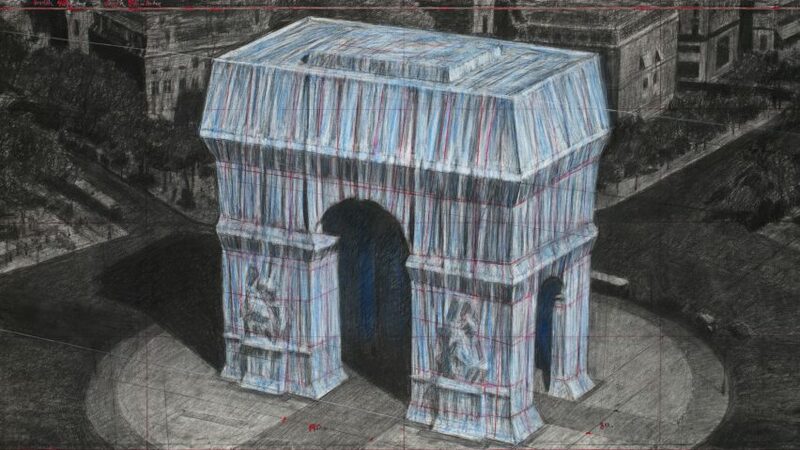 L'Arc de Triomphe, Wrapped will be the first Wrapped piece realised since Jeanne-Claude passed away in 2009. It comes 35 years after the duo wrapped the Pont-Neuf, the oldest bridge in Paris. Independently funding their own public and free-to-view work was always central to the mission of the art duo. "I won't give a millimetre of my freedom [away] and damage my art," Christo told Dezeen in a 2018 interview. The Centre Pompidou exhibition, which will run until 15 June 2020, will explore the historical context of the period during which Christo and Jeanne-Claude lived and worked in Paris from 1958 to 1964, as well the story of the Pont-Neuf Wrapped project from 1975 to 1985. In 1995 the Wrapped project saw the artists cover the German Reichstag in Berlin with 100,000 square metres of silver fabric and blue rope in 1995 for two weeks. Christo's latest realised project was The London Mastaba – a 20-metre-high stack of brightly coloured barrels floating on the Serpentine Lake in London's Hyde Park, which the artist installed last summer as his first large-scale sculpture in the UK. The artist told his life story and discussed some of his best-known works in an exclusive two-part video filmed with Dezeen last year. "Many people have difficulty reading our projects," he said. "They're not normal sculptures, they're not normal paintings. They're many things."